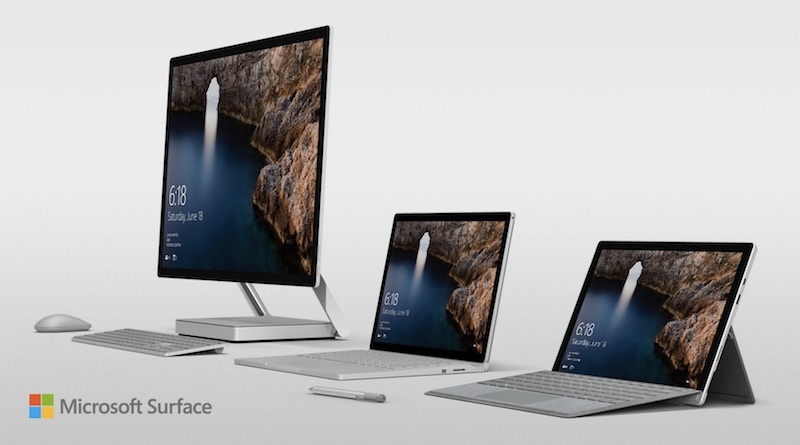 At its media event today in New York City, Microsoft announced a new update coming to Windows 10 devices that's focused on creativity and productivity tools, as well as two major new pieces of hardware: the Surface Book i7 and Surface Studio. The Surface Book is the second generation of last year's original model, while the Surface Studio is the company's all new, all-in-one desktop PC that's aimed at the high-end, enterprise market with a starting price of $2,999. Coming in early 2017, Microsoft today announced the newest update for Windows 10 devices, which it calls the "Creators Update." In the update, the company aims to enhance user productivity with a collection of 3D creation tools, including a new update to Paint called "Paint 3D," that use simplified interfaces to let anyone work and produce fully 3D artwork and projects. With a Windows Phone -- and eventually coming to more devices -- users can even scan real-world objects into digital form to send to friends and family. Microsoft also showed off the upcoming "3D magic" in the Creators Update using Hololens, including a way for users to preview pieces of furniture in their own homes from a web browser. Windows 10 is gaining support for various VR headsets from companies like HP, Lenovo, Asus, and Acer, that all let users interact with the Creators Update's "mixed-reality" abilities, including a feature called "Holo Tours" that transports Windows 10 users into 360-degree videos taken around the world. Priority contacts will be placed on the Windows 10 toolbar in the Creators Update, making it easy to send documents, PowerPoint presentations, pictures, videos, and more by simply dragging and dropping the information onto the corresponding contact. Likewise, these contacts will gain urgent priority when sending anything to you so users can "cut through the noise," and avoid missing emails and texts from close family and friends. The first piece of hardware that Microsoft announced today was the Surface Book i7, which has doubled performance from last year's model and an improved 16 hours of battery life, 30 percent more than the first generation. The laptop's name comes from its included Intel Core i7 Processor, and Microsoft said the top-of-the-line version outperforms the high-end MacBook Pro three times over. Surface Book i7 with Performance Base, which includes professional software meant for intensive tasks, starts at $2,399 (256GB with 8GB RAM) and goes up to $3,299 (1TB with 16GB RAM). The laptop will be launching next month, on November 10. As a companion to Surface Book i7, Microsoft also announced an all-in-one PC called Surface Studio that has the "thinnest LCD monitor ever built" and a 12.5mm thin touch screen. The 28-inch PixelSense Display has 13.5 million pixels and a feature called "TrueColor" that displays colors as close to they are in real life. The company said that there's "no monitor like this on the planet." The PC can also fold down and lay at an angle, enhancing the "studio" aspect of the title and aimed at artists and drawing programs. The computer can be pushed down to a 20 degree angle using a "zero gravity hinge," making it easy to adjust the viewing angle of the Surface Studio with just one hand. 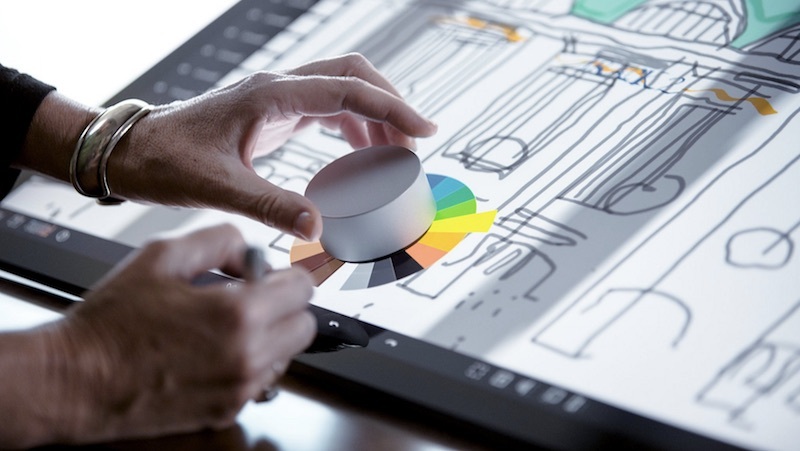 To help with adding new creation tools, Microsoft also introduced the "Surface Dial," which can work off the Studio's screen with various scrolling and adjustment controls. When placed on the screen, the Surface Studio recognizes Surface Dial's location dynamically and offers up new prompts, buttons, and toolsets for artists in apps like Photoshop. This allows users to "more seamlessly move through their workflow," according to Microsoft, without having to fiddle with other toolbar options or programs while they're working. The Surface Studio's processing unit is housed in the small silver box at its base. The cheapest model of Surface Studio includes an Intel Core i5 processor, 1TB hybrid drive, 8GB RAM, and a 2GB GPU for $2,999. That jumps up to $3,499 for an Intel Core i7 processor and 16GB RAM, with the top-of-the-line model running for $4,199 with a 2TB hybrid drive, i7 processor, 32GB RAM, and 4GB GPU. Pre-orders are up now, but the Surface Studio ships slightly later in the year, on December 15. On the gaming side of things, the company said that the Creators Update will even stretch into the company's Xbox platform, including a new focus on e-sports and streaming broadcasts through a new partnership with Beam. With a new tournament creation mode, users will be able to set up and customize brackets and invite their friends to duke it out in games like Killer Instinct, without having to focus on the administrative side of the experience. Besides the Surface Book and Surface Studio, users can also pre-order the Surface Dial for $99, with an expected ship date on November 10. Anyone who pre-orders the Surface Studio will get a Dial included in the box. The company has updated its online storefront with information on all of the new devices, including a comparison chart for anyone trying to figure out which Surface is right for them. But seriously, Microsoft continues to make excellent hardware. Software improvement is slower, but it's coming along. Every Apple fan should applaud this because it is good for the ecosystem to get such amazing competition. The Surface Studio is one gorgeous computer, its very apple like in its elegant lines and function. My iMac with the giant bezels and large chin feels so old and outdated. They beat Apple at their own game: thinness. They're going after the professional market that Apple has completely abandoned. These are amazing, but the pricing is outrageous. The iMac clone starts at 2,999!!!!! A clone in appearance maybe, but certainly not a clone in features. MS is getting really good at this. I fell asleep twice during the event. Might want to pay the doctor a visit. Amazing how similar computers look nowadays to Apple products invented (and still sold) 5 years ago.